Hi guys. I just have to share this quick and easy recipe, because it essential to the Salmon recipe I am serving up tomorrow. 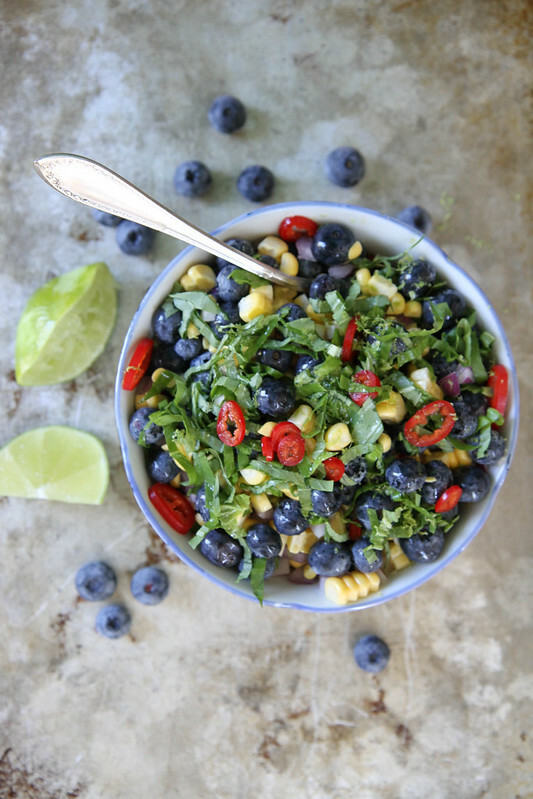 Blueberry Corn Salsa. I am not kidding. 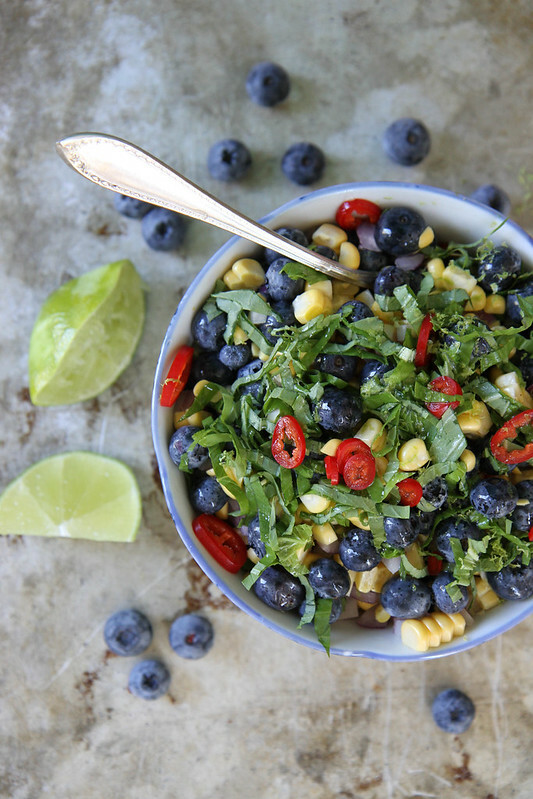 It is so crunchy and has all of the sweetness of the raw corn and blueberries with the tartness from the berries and the lime. Plus some savory (and crunchy!) red onion. The basil and a dash of olive oil rounds all of the flavors out and you just are left with a perfect summer condiment! 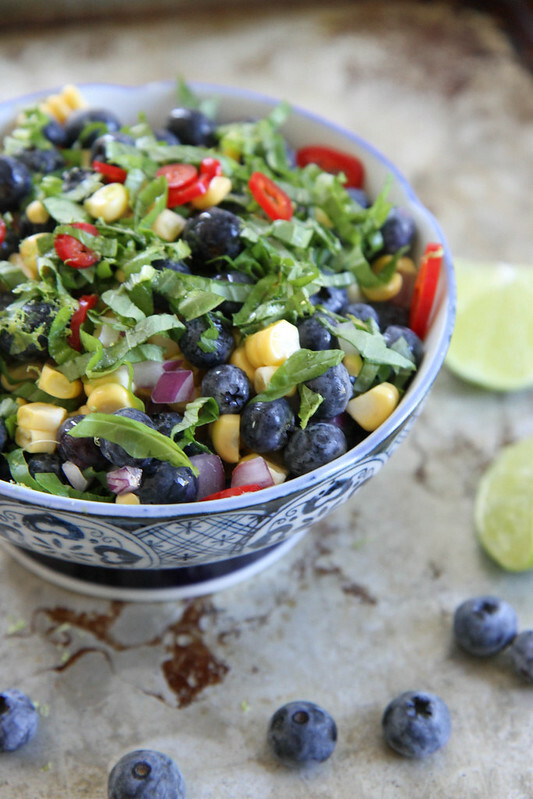 In a medium bowl, toss together the raw corn, blueberries, onion, chili and fresh basil. Drizzle with the olive oil and add the zest and juice of one lime. Season to taste with kosher salt and serve at room temperature or chilled. Blueberries + red chiles, now that has got to be an awesomely fun and tasty combo! Pinned! Beautiful! I love how colorful it is! Yes please, I could eat my weight in this salsa! Oh my gosh I love this!! What beautiful colors! I just adore fruity savory salsas. Ok, I need this 🙂 Love!!! Thank you Jenny! So easy too!! Such a pretty salsa – never have tried anything like this! I love fruit in salsa Marla- its an awesome combo to try! Summer in a bowl! Love! I am an intern at the food and nutrition blog Abbey’s Kitchen by Registered Dietitian, Abbey Sharp, and we are doing a round up of healthy recipes featuring blueberries. We would love if we could include your recipe for “Blueberry Corn & Basil Salsa” in our round up. We simply would be using the photo from the blog post, and the recipe title and then would hyperlink to your original blog post with your blog name and include a nutrition breakdown of the recipe (that we do). We will NEVER re-print your recipe on the blog- always just hyperlink to your website to ensure traffic returns to your website. We may also share a compilation of photos from the blog post on social media to promote it. Please just confirm you’re okay with this and if in the future we can share your content without having to constantly ask. Sure Olivia! thank you for asking!